The following list contains the most recently added items charged to Education, and the list is refreshed on a nightly basis. If you see a title that the library does NOT have, please contact the librarian responsible for your faculty or fill out "Please Buy This". For information about Laurentian’s School of Education English and the courses it offers, please visit the School of Education English's web site. One of the very best general encyclopedias is: The Encyclopedia Britannica. The International Dictionary of Education. 1977. You can also find other dictionaries of education by searching dictionary education as a title in the catalogue. The Encyclopedia of Education. 1971. 10 vols. 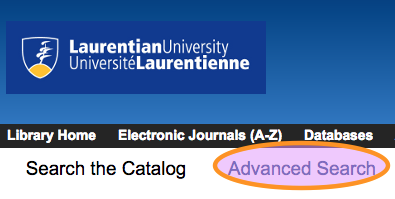 When you click on that, you will arrive at a menu which will lead to an electronic copy of the article you want, or, if not available electronically, to Laurentian's catalogue which will allow you to check if the article is available in print in the library, and if not, to a final link which allows you to order the item through ILL - Interlibrary loan. Reviews Canadiana of interest to children and young adults, including publications produced in Canada, or published elsewhere but of special interest or significance to Canada, such as those having a Canadian writer, illustrator or subject. CM reviews both books and DVDs. Worlds of Words: International Collection of Children's and Adolescent Literature, from the Univ. of Arizona College of Education. This Web site's mission is to promote high-quality, culturally authentic children's literature. Users may do quick or advanced searches for books and receive bibliographic information and a brief description for each book found. The site presents the option of choosing from the categories of Region, Age, or Genre. Advanced Search allows users to specify one age group, one region, and one genre but precludes choosing multiple options under a category. Worlds of Words features two online journals: WOW Stories: Connections from the Classroom, containing vignettes written by educators about children's experiences reading and responding to literature, and WOW Review: Reading across Cultures, a quarterly whose reviews focus on the cultural authenticity of the text and illustrations. Also available are the WOW Currents blog and an events calendar limited to the University of Arizona area. Although somewhat narrowly focused, this site will be useful for teachers, parents, and librarians trying to pick the best books for children. Educators also will benefit from the teaching helps in the blog and from WOW Stories. The Curriculum Resource Centre is located in Room E-102 of the Alphonse Raymond Building #20 on this Campus Map - Carte de campus and it supports School of Education students in their studies and in their teaching placements. Its collection includes curriculum materials, textbooks, pedagogy, native studies materials, as well as teaching aides such as picture books, novels, literacy games, science kits, charts, math manipulables, and musical instruments. The CRC follows the J.N. Desmarais Library protocols in regards to borrowing privileges, loan periods, fines, etc. 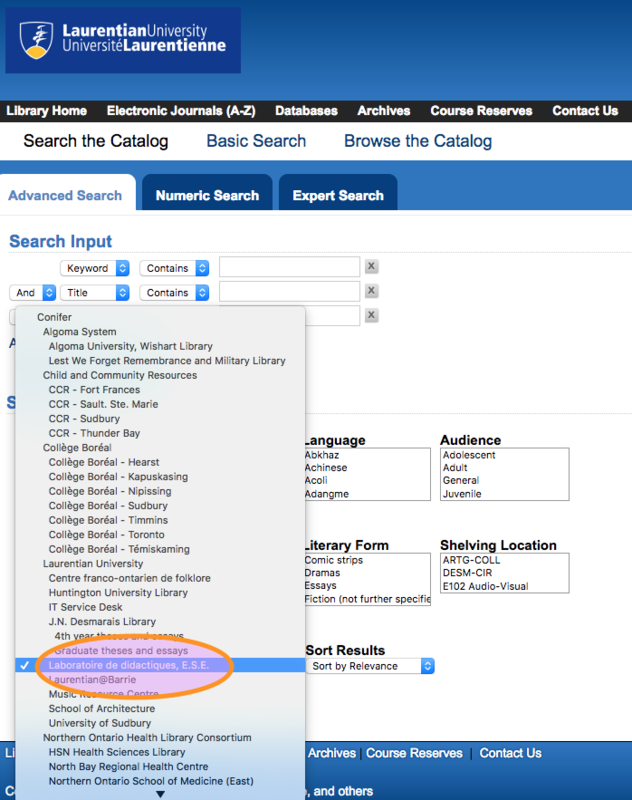 Laurentian University’s Library catalogue includes CRC items and they can be found in a general search. For example, a catalogue keyword search for penguins retrieves far too many results. If you are looking for a children’s book about penguins, it is too time-consuming to look through that many results to find something suitable. Instead, limiting the hits to items held by the CRC is very effective. When your'e at the Library catalogue, click on “Advanced Search"
under "Search Library" click on the pop up menu and select "Laboratoire de didactiques, E.S.E"
Immediately the search shows far fewer hits for penguins in the CRC, including books, and irrelevant hits published by Penguin Books. To remove irrelevant hits, try changing keyword to subject. Please check here for its current hours of operation. You'll find copies of the new Publication Manual of the American Psychological Association (6th ed.) in the Desmarais Library, the Curriculum Resource Centre—and in the Huntington Library. The call number is BF 76.7 P83 2010. It is often referred to as the APA Manual. The Online Writing Lab (OWL) of Purdue University has a comprehensive online guide for citing in APA. This guide will give you general guidelines for in-text citation and for creating an APA reference list for both print and electronic documents. It is intended as a quick reference only. To be certain you are have used APA style correctly, the APA Manual is most helpful.